Red Thread Volunteer Trip: Forever Family Found! 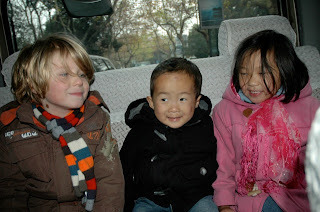 One of our little friends from Hangzhou Orphanage has found his forever family! In the Netherlands! This is a story about a very special little boy who happens to be missing his left arm. That certainly doesn't stop Hong Jie from doing all the things that boys his age love to do...running, climbing, playing with toys...and getting into mischief! When we examined him in October, we found him to be enchanting! He was living in foster care and his foster Nai Nai (grandmother) brought him in for us to see. Our doctor found him to be very healthy, our OT and PT recommended some therapies and our audiologist tested his hearing. Later that evening when I was updating our blog, I noticed a comment from a woman who said she was adopting a child from Hangzhou and was hoping our group saw him. This woman was Hong Jie's soon to be adoptive mother! Having already adopted a daughter with limb differences, the family had requested a child with the same special need. We were thrilled to send a big update and quite a few photos to the anxiously waiting family! Now Hong Jie is home. He has parents and a brother and sister who adore him! Last week the family had a welcome home party for their new son. I received an email from his mother to tell me they put a box by the door for donations to give to Red Thread Charities. By the end of the night they had raised over $700! RTC is so grateful for the amazing families that travel to China to find their children. I love the mom's comments about her son: "We cannot imagine not having him in our family. He's so wonderful! We do not feel in the slightest that his special needs will slow him down. He is a goal oriented person and has the charm to pull off almost anything. Our guide in China told us he has the dangerous combination of being naughty and cute at the same time. He is the type of child that would put a sandwich in your DVD player as soon as you turn your back :-) That is Hong Jie, all right! A huge thank you to Hong Jie's family for the generous donation and allowing us to tell his story. You are very welcome! We hope you may continue to do you work in China and have many more children benefit from your expertise, your time and your good hearts.